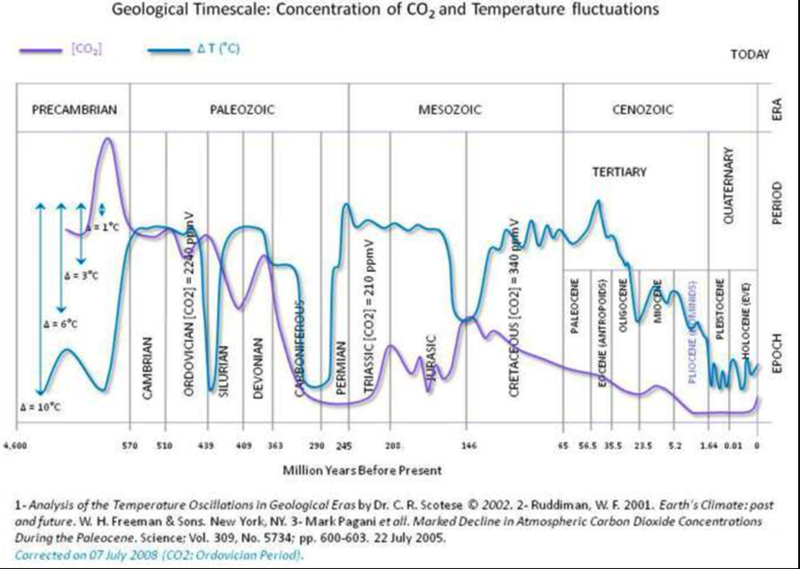 We live in an interglacial period and an era of near C02 starvation. If you let the lefties vote on it, they'd take all the C02 out of the air, it's evil ya know. Good chart, might wake some up. I have never in my life seen such a racist, misogynist, homophobic chart in all my life! You invent stuff like "doubling in CO2 means double acidification" and use that to come across superior, but I never said that. Nobody ever said that, except you. Stop right there and think about that. I don't want to get all philosophical on you, but knowledge is no combat sport. LMAO, yeah, just disregard everything I said. OK then, show me the actual evidence that the oceans are acidifying please. A peer reviewed paper in a major journal. Not a wikipedia entry. Trump knows he only has to worry about another seven years. He is basically saying, "Not on my watch" as he wants to deliver a steroid injection to the U.S economy to beef it up in the body builder of the year contest. Yes, we have wild fluctuation of climate change brought about by natural one off and cyclic events. We should remember that these events will continue, but will be totally exaggerated because they happen on top of climate change (that does not fluctuate, but keeps on growing). Without doubt hard times will be made much harder and will be more extreme because of the background rise of climate disturbance that is a constant, not just a phase. Think hard about that. The level of ignorance I have witnessed here by the American President and the American people is shocking. Y'all got hamburgers for brains? Twice as many wild fires in California this year, twice as devastating. Israel in the biggest drought for 900 years. Some believe the Syrian conflict was initiated because of initial drought linked political pressures. May be just usual, may be a total exaggeration, may be the beginning of something profoundly long term destructive indeed? Let's play Russian Roulete shall we? All the poison we put out into the climate is killing everything slowly, no doubt; US MOSTLY with horrible cancers and strange new illnesses that are making us die earlier and earlier. Just the usual political ignorance and short term thinking, shirking off the inevitable. More Winds, more heavier local rain, less vegetation, there are lots of reasons for erosion, and the body of water as a hole likes to collect the mass where the most mass is, with help of the moon, etc, it builds up in the aequators (?I believe?) and levels start becoming lower in the far north and south. With regard to man-made global warming - what happened between 1940 and 1980 in your chart? Did humans decrease industry and CO2 emissions during this time? Industrial air pollution with aerosols which was increasing up to 1970 and began to decline afterwards due to regulations. I think the plastic in the sea will help do us all in also. Is National Geographic good enough? I guess the war industry blew a lot of stuff up in the air. Peeks at the firty and relaxes after the war until the next revolution. More people with wealth, more consum of luxury. Rising since the 80s. We need some serious upcycling. Get it? Recycling plus improvement. Upcycling. Damn, and here was me thinking that there were wars after 1940. I guess the last 5 years of WW2 were pretty tame and Korea, Vietnam etc were not so bad after all, and nuclear bomb testing and actual use was not really an impact compared to 1 year of WW2 and WW1. Who'd have thought it. Thanks for the explanation - I guess we can rest easy that CO2 levels dropped for 40 years from 1940 to 1980 because there were no wars and less wealthy people. I am glad the science cleared up my question.